“The value of the cargo that goes through those facilities is enormous, and the range of specialized shipments that it can handle is staggering,” says Ginger Evans, commissioner of the Chicago Department of Aviation. The 240,000 square feet of new warehouse space that opened last year builds on recent expansion that helped ORD become of one of the country’s busiest global ports of entry. (See sidebar on next page for more details.) Chicago Mayor Rahm Emanuel joined Evans and other officials from the public and private sectors at a formal celebration in August to celebrate the new facility. The $220 million project opened early in January 2017, and was Phase II of a three-phase northeast cargo development project. Phase I—a 540,000-square-foot facility—also opened ahead of schedule, in September 2016. Phase III, which will add approximately 135,000 square feet, is scheduled for completion in early 2020. All told, the final complex will include 915,000 square feet of warehouse space. Evans explains that the new cargo facility is a direct response to strong demand for moving air cargo through ORD to markets around the world. The project is a cooperative effort between the city of Chicago and Aeroterm, a private real estate developer that specializes in airport industrial projects. Aeroterm is leasing the facility completed in Phase II to Swissport and Burak, two leading cargo handling companies. Cargolux leases some of the aircraft ramp. Tenants of the larger Phase I facility include DHL, Total Airport Services and Alliance Ground International. The city invested more than $62 million of airport funds to build a taxiway to support Phases I and II of the project. Once Phase III is completed, officials say that ORD will boast the largest airside cargo development built at a U.S. international gateway airport in the last decade. Chicago is one of the top U.S. destinations for air trade with China. Trade with Asian countries continues to grow each year as new capacity becomes available at ORD. Currently, the bustling airport serves more than two-dozen cargo carriers from Asia, Europe and the Americas. ORD’s newest warehouse development includes a host of modern efficiencies. Swissport’s 138,000-square-foot facility features an automated material handling system that company officials say is the first of its kind in the region. Electric moving equipment and special pallet platforms allow the system to simultaneously accommodate more than 120 unit load devices (each 10 feet long). The devices never even touch the ground, note company personnel. The warehouse includes 35 truck docks, and adjacent aircraft parking features in-ground fueling and power units to shorten aircraft turnaround time. Building the new cargo facility became possible when Scott Air Force Base relocated from the north side of ORD to southern Illinois during the late 1990s. Evans credits Mayor Emanuel for promoting the project and understanding how important shipping is for the economy of Chicago and the surrounding region. The new facility has spurred a 15% annual increase in cargo volume two years in a row, and ORD is on pace to handle a record 1.8 million tons of cargo in 2017, she reports. City officials say the project has already created 800 permanent jobs and hundreds of temporary jobs for construction and other services. 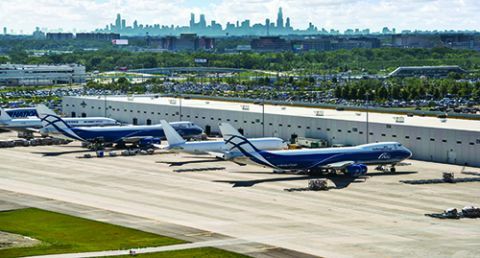 Constructing a dedicated taxilane and adding ramps designed to accommodate 747-8 jumbo jet freighters were key components of the recent project. The new ramps provide 50% more cargo handling capacity. After Phase III is complete, the northeast cargo facility will have more than 900,000 square feet of warehousing and about 1.1 million square feet of apron pavement, including enough space for 13 wide-body aircraft to unload at any given time. Erin Gruver, Aeroterm’s chief development officer, notes that prior to the introduction of Boeing’s more fuel-efficient 747-8, any 747 flying out of Asia had to refuel in Anchorage, AK. The ability to fly directly to Chicago is another factor that enhances the efficiency of shipping through ORD, he explains. According to estimates from the Chicagoland Chamber of Commerce, the average payload of each 747-8 is worth about $3 million. Gruver notes that together, the new northeast cargo facility and the 491,000-square-foot freight facility Aeroterm completed at ORD in 2014 represent the largest investment the company has ever made in a single market. According to U.S. Census trade data statistics, O’Hare International Airport is the fourth-busiest global port of entry for total cargo entering and leaving the United States. Here’s how the various facilities stack up, as measured by value of goods they handle. A key part of the program was an agreement reached with the airlines in January 2016 to build a second international runway that is 11,245 feet long. “It can handle the heavies, and it’s close to the cargo facility. That further improves the efficiency of these operations,” she adds. The northeast cargo development follows a series of other initiatives by the Emanuel administration to invest in modernizing ORD. The city recently announced the establishment of new aeronautical real estate agreements that are expected to generate upwards of $40 million in annual revenue and ensure that the airport can continue investing in the growth of cargo and other operations. The Chicago Department of Aviation is also working with its airline partners on a plan to redevelop terminals, expand capacity for passenger amenities and improve ORD’s global connectivity. After that is completed, more physical expansion is likely.